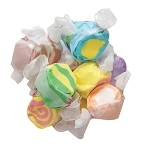 Choose up to four flavors of our delicious Salt Water Taffy for the price of a single case. 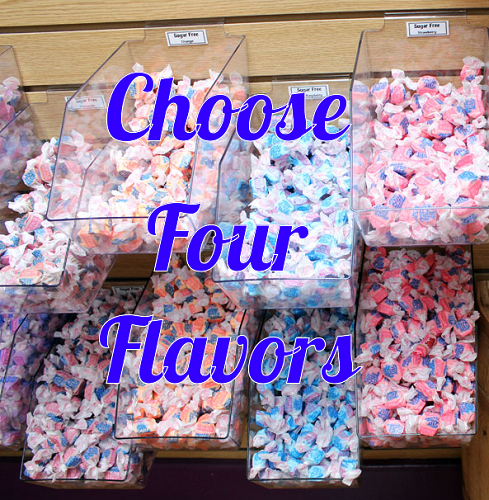 4 flavor choices at 5 pounds each of individually wrapped taffy candy are a wonderful way to increase your bulk taffy display. There are so many choices of wrapped taffy to choose from. You can go with traditional options like vanilla or pick some creative flavors including maple bacon. The decision is completely up to you. Take full advantage of this fantastic deal and add a little variation to your store. Patrons know that signature twist-end wrapper of the soft taffy. Stock up your clear bulk bins for a great shopping experience. The bulk candy will attract shoppers all on its own and you will be thrilled with the profits resulting. 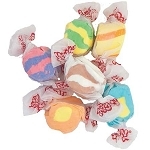 Order your taffy at wholesale prices! This is the best Taffy we have had. Not too sticky at all and just so very creamy. I recommend their Taffy. The flavors we purchased were Banana, Vanilla, Smores and Cinnamon Swirl. These flavors were really good.